Hello my name is Carole. 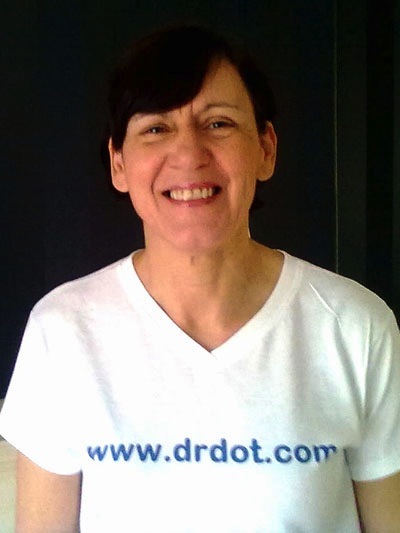 Although born in Liverpool I am now living in Manchester, I have been a Sports/Massage therapist for 20 years. I have also worked as a College Lecturer for 10 years teaching Sports Therapy and Holistic Therapies. I specialize in deep tissue and sports massage and can provide very deep work when needed, also practicing hot stone massage, reflexology, aromatherapy, I am a holder of the Football Association Treatment & Management of injuries Diploma. I have worked with the Welsh National Judo Team, Olympic Judo Medalists, Football and Rugby Clubs and was lucky enough to do some work with Riverdance, I love the work I do and always give 100% to my clients. My own background is sports having completed Nationally in Judo (2nd dan) and competing Internationally for Gt. Britain in Powerlifting placing 2nd in the World Championship, Won the Europeans twice and won the British Championships. I am lucky to have the chance to now work with Dr. Dot's massage team, I can cover Manchester, Liverpool and Leeds.